I spent the last hour of the morning at my tailors, down the street. As the shop is so close to me, I chose to walk. It was a brisk 20ºF by 10:45 am, but that didn’t worry me. A few years ago I came across the coat pictured in a vintage store. It was made in May of 1958 by Sandon & Co. Ltd. of Savile Row, London and has a red tartan horse’s blanket of a lining. I imagine the cloth is at least 28 ounces. It practically stands up on its own and weighs in at about 20 lbs. . It keeps me very warm — sort of like carrying a sandfilled rucksack uphill for a mile. Besides, I am wearing cashmere socks, a flannel suit and silk long underwear. All very fine, except that taken separately each of the articles of outerwear is difficult enough to pull off (with the possible exception of the scarf which is not as jarring when worn with a solid coat — which it never is by me.) Worn together, they are anachronistic. Especially if one is not a renowned artist, dandy, or both. But consider that age-old question: if the dandy meets the savage in the forest, who is the more ridiculously dressed? I am very out-of-place in my neighborhood. I see the current fashion as a revolt against the “metrosexual” marketing nonsense. Manly is in again. Tough times call for tough hombres. And frankly, I bet it takes much less effort. No boot polishing. No pressing or drycleaning bills. No shaving. No art, but just as much artifice. Which invites the question: if you’re going to dress up, why not dress well? That may preclude my ensemble as seen above; but grant me that it is anything but thoughtless. Fashions will change. But I doubt that I will see a return to the styles of the past which I so revere. “21” has just dropped its requirement that men wear ties to be admitted. Time to update and still try to cut a more elegant figure. I’ve just commissioned a pair of flat front flannel trousers. They are in a slimmer silhouette. This entry was posted in Elegantology and tagged Bowler hat, Derby, Gandhi, Savile Row. Bookmark the permalink. I really love your coat and my next trip to NYC, I’m going to search out a vintage store to try and find something similar! Los Angeles is too warm to hope to find one here although who knows? Possibly someone, stunned by the climate here, got rid of “something similar”. You have inspired me. And the post was just as much fun as the coat! Your comment regarding the theory that tough times call for tough hombres reminded me of a Wall Street Journal article this week that mentioned many law firms are going back to power suits (think the movie Wall Street) and high polished shoes as a way to again instill confidence in their clients during a period of uncertainty. In what has become a modern cycle a bad economy can be good for mens suiting. bevglen, thanks. Best of luck finding something similar. It’s a treat to wear — a woolen suit of armour. Atheneus, traditionally that’s the way things work. In my opinion, dressing up a bit more will instill more confidence in the employee as much as in the client. What a treat to have stumbled onto your site! 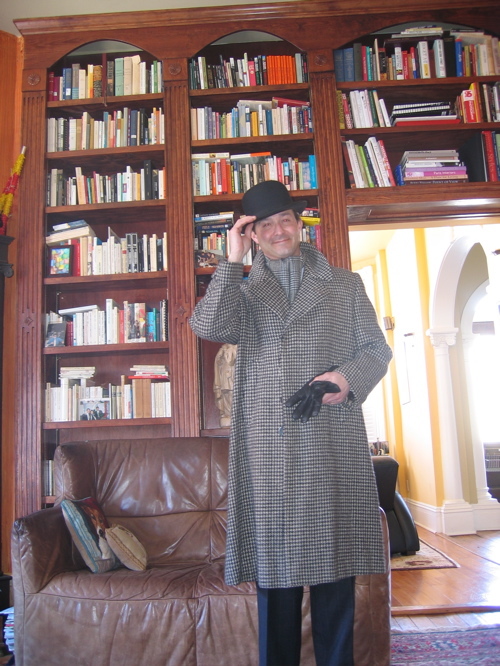 I love the coat, and the bowler is perfect. I’m so sorry to hear that “21” has changed their tie requirement – I do believe that elegance in demeanor, dress, and speech is always rather startling to observe, so unaccustomed are we to seeing it nowadays. I know that, when I see and hear it, I feel reassured. I live in Dallas – thank you so much for making the effort to inspire! I have a wonderful coat of my mother’s that seems to be of a similar heritage. I handed it to a five year old once and the poor thing nearly fell over. Also just spent a ridiculous amount of money having the moth holes repaired – stupid insects. Love the hat! It is such a delight. I do think that the revolt against the metrosexual trend was under way right from the start for many. Simply that the tides of trends have turned with the economy. If I remember correctly, you live in the Fan, right? can you recommend a tailor around here? Hello SB, yes I can. For alterations I trust Franco of Franco’s Fine Clothiers at Lakeside Ave to do a superb job. Also George’s Alterations Shop on Gaskin’s Road comes highly recommended. Vincent’s Custom Tailor Shop has a a good reputation as does Alan Zimm (it has been some years since I used Mr. Zimm, but he did a very nice job on some vintage items that I had.) MTM programs: I recommend my tailor Larry Wood at Leviner-Wood on Monument Ave (he is now offering reweaving — more later.) Nathan’s has a good reputation and for shirts, I have used Franco’s MTM shirt program (through Lakeside) with good results. TBD, I’m glad you had the coat restored! Worth it in the long run. Great blog, by the way, coming from someone young and closer to the beards, flannel, and dirty boots crowd you mention. It reminds me of Hemingway’s A Moveable Feast, but done Richmond style (the charming style of richmond, not the dirty style). Once while in San Francisco, I purchased a vintage black faille 3/4 sleeve opera coat and whenever I wear it, compliments flow freely. It is equally stunning over trousers, long slim sheath dresses as it is with a cocktail dress. That’s what I love about vintage finds, the versatility and the history. Love your dashing coat and hat! Mrs. PvE, Tremendous find! I love those coats and agree that they are very elegant when worn with absolutely anything at all. I’ll have to dig up for you the Richard Merkin article from his old GQ column in the 1980’s. Merkin tells the story of walking across campus at the Rhode Island School of Design, where he taught for forty years, and spotting a student in a stunning overcoat of obvious bespoke origins. He stopped the student and asked where he got the coat. He told Merkin that it came from a thrift store in Philadelphia, courtesy of his sister. Merkin was floored when he saw the label. Scholte…Savile Row…London…former owner…Anthony J. Drexel Biddle. Merkin asked the kid if he’d sell it and the answer was an emphatic “no”. Merkin then asked to borrow the coat so that he could have a tailor copy and I think…it’s been a while since I read the article…Merkin prevailed in having a copy made. If you and your followers haven’t been to Bertie Wooster on Fulham Road in London…I’d highly recommend it when you are next over there. My pulse races every time I walk in the door. Vintage bespoke goods…It’s Brideshead Revisited on steroids…I’ve never walked out empty-handed. The world of style, elegance and decorum is indeed, slowly slipping away and it’s a shame. I just blogged about wearing Belgian shoes with aplomb. I can do that with no problem. Wish I possessed your level of swagger…enough to wear with superb style and dignity…a bowler! Thank you for your comment. And for reading. I’d love to see the article as I posted about him in the past. Don’t mind if I add you to the blogroll I hope? In re: your swagger… you’ve got it. I expect it’s got more to do with your work environs that keeps you from wearing such a garment. Believe me, I understand. I no longer deal with clients, being sort of retired, and that makes all the difference in the world (even if mine was a “creative occupation.”) My friends have come to accept me for my eccentricities; and the well-stocked bar. Mrs. E. keeps them amused. Keep fighting the good fight. I’ve read the last two posts on your blog and will continue to read, via RSS feed, with great enthusiasm. I am of the pattern on pattern school and so I think the scarf is perfect. I was considering what to wear to a casual party last night: dressy boots with heels, best skinny jeans and a black velvet top. Suddenly I thought, this is not what MR. E&E would recommend. Kept the boots and went with lined wool pants in subtle gray/brown tweed and a taupe angora sweater with a droopy cowl neck — the combo that makes everyone compliment my gray hair! Very easy and elegant and no more effort than jeans. Thanks again for a great post and for keeping me on the elegant path. Huzzah Linda! A little thought goes a long way with no extra effort. You were, no doubt, one of the most elegant in attendance.